With his acute sense of tragedy and paradox, Niebuhr would not put full faith in grand designs of economic justice (if those existed today). But he would also doubt there could be even proximate justice, apart from a confrontation with privilege and an unabashed plying of worldly power. Reinhold Niebuhr is indeed a valuable exemplar for this (and any) age. You affirm his opposition to plutocrats thwarting the common good by assuming and applying a special privilege to corner resources, but you seem to shy away from affirming his call to those oppressed by plutocracy to confront it and to thus gain and exert power for fairer distribution of wealth and for a more communitarian governance. Yes, he stood firm against the totalitarianism of Communism, but he championed social justice and those who advocated it democratically, whether individually or collectively (such as through Americans for Democratic Action and in labor unions). It was such advocacy which contributed greatly to the results of the presidential election and which motivated such nonviolent protest for the common good as Martin Luther King’s crusades for racial and economic justice. Petitioning for a redress of grievances and peaceable assembly to do so remain among our most precious rights as Americans. Thanks for that very informed comment, Kim. If I were hedging a bit at the end, it’s because Niebuhr changed his mind about many things, although I do think he would see a confrontation with privilege as necessary in today’s circumstances. Was Niebuhr’s hesitancy to advocate for social movements that would overcome plutocracy power through authoritarian means rooted in a Calvinistic doubt ? That outlook that says Hey a President should be a great and good guy but maybe we need a congress to make the laws while he executes them.. And congress should be good but maybe we need a court to rules when congress does something un-constitutional. It seems that he is arguing for a checks and balances approach to dealing with a plutocracy – labor unions being the prime example that somewhat equalizes while not eliminating the power of the plutocracy. I think that’s it. He favorably quoted James Madison as saying, “The truth is that all men with power ought to be distrusted.” And he stressed the need for countervailing forces–which, in Moral Man and Immoral Society, were basically about checking corporate and economic power. Thank you for this poignant reminder that theology can speak on a broad level to our most dangerous behavior as individuals and as a nation. 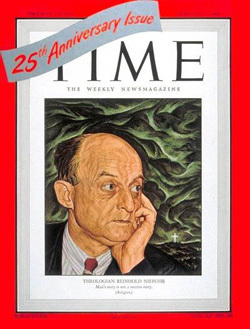 Niebuhr’s emergence as a national figure who captured the attention of the New York intelligencia can be attributed largely to circumstances that allowed religious figures more visibility in a less crowded media field, but that wouldn’t account for the power of his insights and their stinging relevance in any age. As you remind us, Niebuhr’s ministry was a reflection of the biblical prophets. He channeled Isaiah as surely as he represented the pains of 20th century American class oppression. Such voices still exist at the periphery of our public discussion but have nowhere near the influence which Niebuhr exerted at his propitious time. The loudest Protestant message is a shabby endorsement of individualism by those who have taken the spotlight. Thank you for your very distinct voice, Ken Briggs. And thanks for underscoring RN’s prophetic edge, which I didn’t quite do. There’s much to say also about his influence on the prophetic figures of the ’60s, namely Martin Luther King, William Sloane Coffin, and even Abraham Joshua Heschel, who was Niebuhr’s closest friend throughout the ’60s.